Bank of America offers a variety of MasterCard and Visa credit cards for consumers to choose from. Each card includes an array of options designed to cater to the needs of specific groups of consumers. For those consumers who desire to earn cash back on their favorite purchases, the cash rewards MasterCard and Visa credit cards are worth considering. Susan G. Komen MasterCard gives individuals the opportunity to support breast cancer awareness. Each time a new card is activated or renewed, the Susan G. Komen Foundation for the Cure receives $1. The organization also receives .20% of all net retail purchases ($3 minimum). MLB MasterCard enables consumers to save up to 20% on MLB products and events by using their adorned team logo card. Joe Taylor Jr. of Card Ratings notes that this card can be quite beneficial to MLB fans since they can also take advantage of the perks offered by MasterCard to their account holders. However, those individuals with fair or poor credit will not qualify for inclusion into one of these programs since an excellent credit score is required. Bank Americard Cash Rewards offers a $100 cash back reward if $500 is expended within the first 90 days. In addition, cardholders receive a 10% customer bonus when rewards are redeemed into a Bank of America savings or checking account. Reviewers from Nerd Wallet agree that this card is one of the best out there because of the impressive reward system that enables cardholders to earn a decent amount of points without having to pay an annual fee. World Wildlife Fund offers a 10% cash rewards bonus and $100 reward on qualifying purchases. Bank of America also contributes $5 to the organization for each new account opened or renewed and .25% of all retail purchases. Unfortunately, the perks offered on gas and grocery transactions only qualify for up to $1,500 each quarter. Consumers also enjoy earning points that help them save big at their favorite retailers. Bass Pro Shops Outdoor Rewards allows cardholders to earn 5% per dollar spent at their locations and 1% on all other purchases. Points can be redeemed on Bass Pro products. Cardholders have access to Visa's Signature entertainment and travel benefits and are not assessed an annual fee. Consumers also have the ability to earn triple points for a limited period of time with the Bank Americard Power Rewards Visa. Dawn Allcott, a credit card expert from Credit Shout, notes that the card is still a great option after the "triple power dissipates" because there is a lot of flexibility with redemption options and an annual fee is not assessed. Michael Dolen of the Credit Card Forum feels that the Bass Pro Shops Outdoor Rewards Visa is a decent option since it does not have an annual fee and enables cardholders to save on retail purchases while aiding in conservation efforts and earning rewards. Bank of America's MasterCard and Visa travel and airline rewards credit cards offer redeemable miles to those who travel frequently and are looking for ways to reduce airline expenditures. Spirit Airlines World MasterCard allows you to earn 15,000 miles, which is the equivalent of three off-peak round-trip airfare tickets. In addition, customers who spend $10,000 or more each year qualify for 5,000 free Spirit Anniversary Miles. Two miles is equivalent to $1, and can be redeemed once a balance of 5,000 miles is reached. Norwegian Cruise Line MasterCard allows new cardholders who are eligible to receive $100 off their next cruise with the first qualifying purchase worth 10,000 points. Each point is worth $1 and Norwegian Cruise Line purchases qualify for double-points, redeemable once the balance reaches 10,000 points. A major drawback of the Spirit Airlines World MasterCard, as noted by Michael Dolen in the Credit Card Forum, is the inconvenience that can be caused by having to call customer service to redeem miles and the fees associated with doing so. He also mentioned the "off-peak nightmare." Consumers who do not prefer to travel via the Norwegian Cruise Line will more than likely locate more useful perks elsewhere as noted by Mr. Credit Card. Bank Americard Travel Rewards enables cardholders to earn 10,00 bonus points after qualifying purchases and a 10% customer bonus for redemption into a Bank of America savings or checking account. Cardholders also receive 1.5 points for every dollar spent. AAA Member Rewards Visa enables cardholders to earn 2,500 bonus points as an introductory offer, three points per dollar on AAA purchases and two points per dollar spent on gas, groceries and at drugstores. All other purchases earn one point per dollar. Royal Caribbean offers an introductory offer of 10,000 bonus points. Cardholders also earn double points on Royal Caribbean international purchases and one point per dollar on all other purchases. Applicants with excellent credit are offered a low APR of 11.24%. Alaska Airlines offers an introductory offer of 25,000 bonus miles. Cardholders also earn five miles for every dollar spent on select hotels and restaurants and three miles per dollar on Alaska airline products. Standard purchases qualify for one dollar per mile. These four cards do not offer rewards systems that all consumers are pleased with. The AAA Member Rewards Visa only offers 2,500 points as an introductory incentive, which is equivalent to $25. Dawn Allcott also notes that Royal Caribbean's points must be redeemed for on-board purchases, making them difficult to use. Students who desire to get on track financially and build their credit can benefit from the Visa credit cards for students. 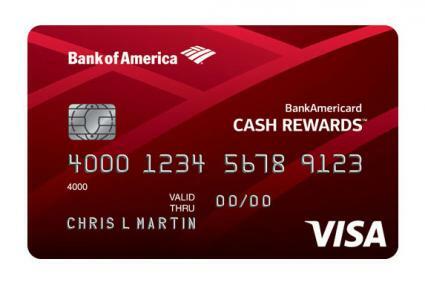 Bank of America offers Visa credit cards for students looking to build their credit or earn rewards on purchases and travel. Bank Americard Travel Rewards for Students enable students to earn 1.5 points per dollar spent. Bank Americard Cash Rewards enables students to earn 1% on all purchases, 2% on groceries and 3% on gas. The grocery and gas rewards only qualify up to $1,500 per quarter. Bank Americard for Students offers the lowest APR among all products of this type. Reviewers from Card Hub agree that these cards are a great options for students looking to build their credit from scratch. They were also pleased with the exceptional level of customer service received when discrepancies arose and the fraud protection offered to all cardholders. In addition, the 0% introductory APR gave students the opportunity to develop responsible card usage and payment habits without having to worry about interest. If you have excellent credit and are searching for a low interest rate, Bank of America offers two credit cards worth considering. If you pay an amount above the minimum payment and on time each month, you will qualify for a $25 cash reward each quarter that can be redeemed automatically. You can also earn $5 per quarter just by having another qualifying account. A major benefit of the Bank Americard Better Balance Rewards MasterCard is the ability to easily make $120 per year just by banking with them and maintaining healthy habits. Hiep's Finance also mentions the uniqueness and attractiveness of being rewarded solely for paying on time. Cardholders can enjoy a low APR with the Bank Americard Visa. In addition, no APR is assessed during the introductory period of 15 months and the balance transfer fee is only 3%. This enables consumers to pay off high debt balances easier without worrying about the accrual of an excessive amount of interest. If you have bad credit, Bank of America offers the Bank Americard Secured Visa which enables you to access a credit line of $300-4,900, depending on your income and security deposit. Compared to other secured options on the market, Michael Dolen suggests that the $39 annual fee and APR of 20.24% is a decent offer. In addition, you may be able to convert the card from secured to unsecured, which is an option that many creditors do not offer. Before choosing a card that fits your needs, be sure to thoroughly review the terms and conditions. Look closely at what each card offers and figure out which one will be most beneficial to your situation.